In Denver Real Estate News 5280 Magazine: Why Five Points is no longer on the verge of becoming Denver’s next hot neighborhood. See the full article here or read a tid bit below. Scroll down to see homes for sale in the Five Points neighborhood in Denver. For more than 30 years, Denver has been trumpeting the revitalization of Five Points. After its tumble from a lively center of music and culture in the 1930s and ’40s to a neglected corner later in the 20th century, many attempts have been made to restore the neighborhood. With each effort, the media hailed Five Points’ return: “Five Points—Making A Comeback” the Rocky Mountain News crowed in 1991. 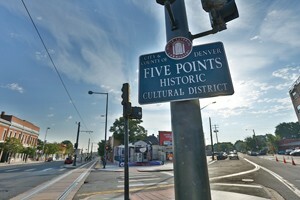 “Five Points sits on the verge of change” the Denver Post claimed five years later. But Five Points isn’t “poised” to become anything anymore. It already is. If you need convincing, visit Rosenberg’s Bagels & Delicatessen on a weekend and wait in the 20-person-deep line. Or tour the area’s dozen or so construction sites; they represent $250 million of investment by the city and private developers. Or eyeball the soaring median home values: $317,500 in 2013, up roughly 31 percent from 2009. 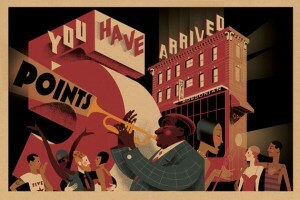 Today the question isn’t if Five Points will take off; it’s why, as in, Why now? In part, it’s because our expanding millennial population—the pistons inside Denver’s booming economic engine—and our baby boomers both crave easy access to downtown, says Paul Books, founder of Palisade Partners, a developer involved in several Five Points projects. So every central neighborhood is experiencing a renaissance. “And [Mayor Michael Hancock] made Five Points a priority,” Books says. There may be no better illustration of this than the 2013 Welton Design/Development Challenge. Two years ago, Denver’s Office of Economic Development (OED) awarded a total of $475,000 to five commercial and mixed-use residential projects along the Welton Street corridor. Not only does this provide an important capital infusion for small projects, such as Rosenberg’s, but it also serves as a signal of the mayor’s commitment to the area, where the Manual High School graduate was raised. Coupled with unique tax breaks (see “TIF,” below), the grants allow the city to foster development while preserving the legacy of a gentrifying area. Yes. The “G” word. “I don’t have a conversation without gentrification coming up,” says District 9 Councilman Albus Brooks. “It’s happening everywhere, but in Five Points it has a face.” As home values in Five Points have climbed, minority populations have declined. Property taxes have become burdensome. In July, Hancock announced plans for a $15 million fund to preserve and build at least 6,000 affordable homes throughout the city, especially in transit-oriented development areas like Five Points. Most of that money would come from a property tax mill that the city has been crediting back to homeowners (roughly $30 to $50 per home annually). The rest could come from a “housing linkage fee,” essentially a one-time fee developers would pay…..
See the rest of the 5280 Article here.